Alva Noë’s Action in Perception offers a provocative and vigorous defense of the thesis that vision is enactive: visual experience depends on dispositional motor responses. On this view, vision and action are inextricably bound. In this review, I argue against enactive perception. I raise objections to seven lines of evidence that appear in Noë’s book, and I indicate some reasons for thinking that vision can operate independently of motor responses. I conclude that the relationship between vision and action is causal, not constitutive. I then address three other contentious hypotheses in the book. Noë argues that visual states are not pictorial; he argues that all perception is conceptual; and he argues that the external world makes a constitutive contribution to experience. I am unpersuaded by these arguments, and I offer reasons to resist Noë’s conclusions. I was reading a story today on the BBC news website on the plight of women in Afganistan - truly terrible of course. However, something else caught my eye, which, after some brief fact checking, turned out to be rather eye-opening. Despite all of the problems that women face in Afganistan, there are 91 female members of parliament (out of 361). Bear in mind that is approximately 25.2%. Now consider the UK, with 646 MP's, of which 126 are women. That's 19.5%. Now, I'm not going to comment on politics, but given the vast increase of political correctness and sexual equality here in the UK (and I imagine elsewhere in the western world), plus the seemingly prevalent view of Afganistan politics being somehow 'backward', there seems to be something wrong with this picture. I think perhaps that the political institutions here could do worse than look to Afgani women... I wonder if there is a similar situation in the US? - The Mouse Trap reviews the thoughts of Simon Baron Cohen on imagination, and how imagery is necessary for imaginiation - thus introducing the biological grounding of the capacity for imagination. Memory networks are formed in the cerebral cortex by associative processes, following Hebbian principles of synaptic modulation. Sensory and motor memory networks are made of elementary representations in cell assemblies of primary sensory and motor cortex (phyletic memory). Higher order individual memories, e.g. episodic, semantic, conceptual - are represented in hierarchically organised neuronal networks of the cortex of association. Perceptual memories are organised in posterior (post-rolandic) cortex, motor (executive) memories in cortex of the frontal lobe. Memory networks overlap and interact profusely with one another, such that a cellular assembly can be part of many memories or networks. Working memory essentially consists in the temporary activation of a memory network, as needed for the execution of successive acts in a temporal structure of behaviour. That activation of the network is maintained by recurrent excitation through reentrant circuits. The recurrent reentry may occur within local circuits as well as between separate cortical areas. In either case, recurrence binds together the associated components of the network and thus of the memory it represents. Reference: J. M. Fuster, "Cortical Dynamics of Memory," International Journal of Psychophysiology, vol. 35, pp. 155-164, 2000. • Identifying relevant groups of UK-based scientists and engineers, based in industry and academia, and bringing them together for interactive workshops at which common ground was established. • Creating an accessible summary of the work done during the year, with the assistance of a consultant science writer (Michael Kenward) and distributing this to a wide range of relevant groups (CUGPOP, members of Research Councils and their Research Boards, selected scientists in other countries working on similar topics). A book is also in preparation. "Cognitive systems are natural or artificial information processing systems, including those responsible for perception, learning, reasoning, decision-making, communication and action"
This is a very broad definition, but having said that, it is also (I think) uncontroversial, and may form the basis upon which further constraints and qualifications may be added (such as, for example, those proposed by Clark and Grush, as I've looked at previously). The BBC has a nice short video report of this year's international robot games, held in San Francisco. Click here for link to the video... I think it's just interesting to see some of the designs present, which seem for a large part to be humanoid, rather than the myriad of possibilities to 'roboteers'. What's that Thing called Embodiment? The term 'embodiment' has become progressively more prevalent in what may for simplicities sake be termed the artificial intelligence (AI) literature, as there is a more explicit recognition that interaction with an environment is necessary for intelligent behaviour. In cognitive science, the term is similarly used - as a requirement without which there can be no intelligence. However, what is actually meant by the term varies among it's users, sometimes to quite a wide extent. In an effort to promote understanding among this variation, Tom Ziemke has brought together a number of notions of embodiment as used in the AI and cognitive science literature. In this paper (reference at end of post), the concept of embodied cognition is briefly introduced (it's only a short paper), and the various ways in which it may be defined, followed by an outline of six notions of what kind of body or embodiment is actually needed for this embodied cognition. That a physical body is needed is not as generally accepted as may initially be thought. Wilson (2002) identified six differing views of what embodied cognition was (setting aside for a moment any potential problems with the definition of cognition). Among these however, only one explicitly deals with the body. These six different views are encapsulated by the following six quotes, from various sources: "Cognition is situated" (which takes place in the context of task relevant inputs/outputs), "cognition is time pressured" (real-time interaction with the world forms a major constraint), "We off-load cognitive work onto the environment" (very similar to Brooks' assertion that the world is its own best model), "the environment is part of the cognitive system" (for example distributed cognition), "Cognition is for action" (the purpose of cognition is to control autonomous agents), and finally, "Off-line cognition is body-based" (the body may provide the basis of abstract concepts by grounding in sensory/motor experience). These points are only mentioned briefly, as they form the prelude to the main discussion of what sort of body or embodiment is actually required. From the differing views of embodied cognition, it has been seen that the role of the body has surprisingly little importance, and very little characterisation. This begs the question then of how this embodiment may be characterised. Does, for example, the very presence of a humanoid robot body enable human-like cognition? The majority of this paper looks at six different notions of what exactly constitutes embodiment, or what is required of a body. These are embodiment as: structural coupling, historical embodiment, physical embodiment, organismoid embodiment, organismic embodiment, and social embodiment. Structural coupling simply means that the agent and environment must be coupled in such a way that they may produce effects on one another - i.e. information (be it sensory or motor or other) may flow in either direction between the agent and the environment. This is a fairly broad definition, although attempts have been made to provide almost mathematical definitions. It should be noted however that this form of embodiment makes no requirement for a physical body. Indeed, from some definitions of embodiment as structural coupling, there is no requirement that the agent be a cognitive system. An interesting example given in the paper is of a rock on the Antarctic tundra. The wind over the tundra perturbs the rock, and the rock in turn perturbs the winds. This may then be considered structural coupling, which according to the brief definition outlined above, would be an embodied system. Further to embodiment as a structural coupling between agent and environment, a number of researchers have emphasised the necessity for an agent to have a history of environmental interactions for it to be considered embodied. The reasoning is that the agent must have gained or learned from its interaction with the environment - it has have gained knowledge from this interaction which is inseparable from the agent itself - embodiment: history matters. As previously though, this definition is not particularly restrictive (although more so than 'simple' structural coupling), and does not inherently require a physical body. Physical embodiment requires physical instantiation, excluding for example software agents. Rodney Brooks describes this as physical grounding, where the argument is that "to build a system that is intelligent it is necessary to have it representations grounded in the physical world ... [i.e.] it is necessary to connect it to the world via a set of sensors and actuators" (Brooks, 1990). There does however remain a difficulty in defining sensors and actuators. In general, both physical and historical embodiment may be considered as special cases of structural coupling, which are not mutually exclusive. A more restrictive view is organismoid embodiment. This is far more restrictive a type than physical embodiment in that it requires that not only there be a physical body, but that this physical body has the same (or at least to some degree) sensorimotor capabilities/capacities as a living body - an organism. An example provided of this type of embodiment is the Khepera small mobile robot (roughly puck-shaped robot with two powered wheels and configurable sensory capabilities) used in a research project, adapted with an auditory sensory system designed to mimic that of cricket. This may be considered as organismoid embodiment, as it reproduces an essential morphological detail of the biological system, the distance between the 'ears', even though the main bodies are very different. Other examples of this form of embodiment include the well known humanoid robot Cog (of MIT), created on the theory that in order to study human level cognition/intelligence, one must deal with human-like artefacts. This theory in a more general form is central to the view of organismoid embodiment: the body provides a context for experience, and a basis for grounding concepts, which would be unique to that body type. A nice example is given in the paper: if "the concept of 'grasping an idea' is grounded in the bodily experience/activity of grasping physical objects, then a robot without any gripper arm/hand could hardly be expected to be able to understand that concept". Going one step further still than organismoid embodiment, organismic embodiment holds that not only is an organism-like body required, but that it must be an actual organism, i.e. a living body. From what has been discussed in a previous post (Mechanistic and Phenomenal Embodiment), the concept of an autopoietic organism is relevant - i.e. one which "is a special type of homeostatic machine for which the fundamental variable to be maintained constant is its own organisation", as opposed to man-made machines, whose purpose and organisation is predefined by the (human) designer. Refer to this post for a more detailed discussion. A paragraph in summary of this type of embodiment succinctly describes the advantages and disadvantages of this notion: "The notion of organismic embodiment has the advantage that it limits cognition to a natural kind of system, i.e. living organisms. Obviously, however, its usefulness to cognitive science, as traditionally conceived, is limited in the sense that by equating life and cognition to some degree it simply dodges the question of what exactly it is that makes human or higher-animal cognition particularly interesting". The final notion of embodiment discussed (albeit briefly) in this paper is social embodiment. This view essentially holds that bodily states (such as hand/arm gestures, facial expressions, etc) are not simply used in social interaction, but are central to the processing of social information. The role the body plays in this is to provide a context to the actions of others during social interaction (although not mentioned, the role of mirror neurons is implicated here), and to produce affective states as a result of this. This type of embodiment seems to be very closely related to physical or organismoid embodiment in general, since the presence of a physical body seems essential, although there are no inherent restrictions or requirements on the actual type or morphology of the body. In summary, this paper has looked at a number of seemingly disparate but interrelated notions of embodiment in an effort to promote understanding of the term 'embodiment': a term which is often used, and almost always assumed to be essential for intelligence. In doing so, it has placed the discussion of these types in the context of embodied cognition, as it is in this arena that the most ambiguities currently lie. The BBC News Health section today reported on the development of a mobile robot by the US army designed to carry battlefield casualties back to safety. 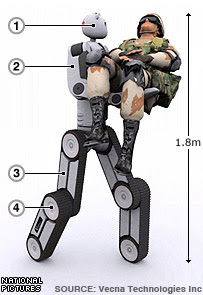 Named the Battlefield Extraction Assist Robot (BEAR), it apparently has a "friendly appearance" to put wounded soldiers at ease. It's not an autonomous robot, with a human operator required, but the construction seems quite impressive - capable of travel over rough terrain, and even stair climbing, whilst carrying people. Picture from the BBC News website story.